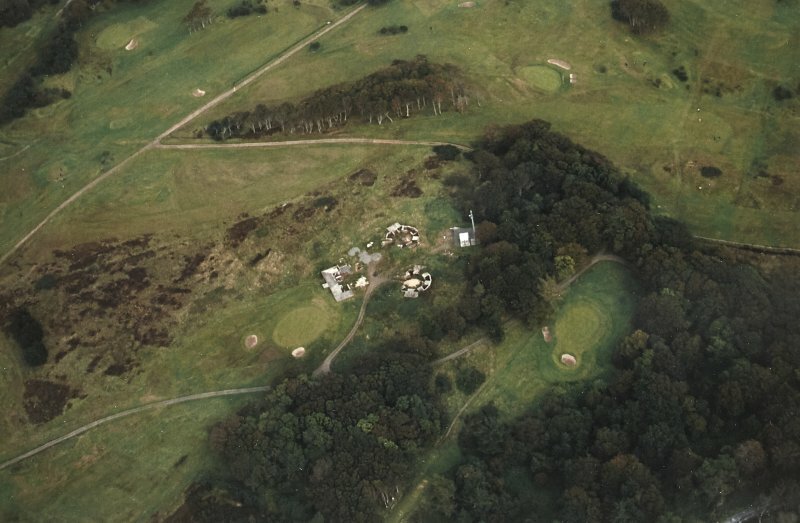 Oblique aerial view centred on the remains of the anti-aircraft battery and bunkers, taken from the NNE. 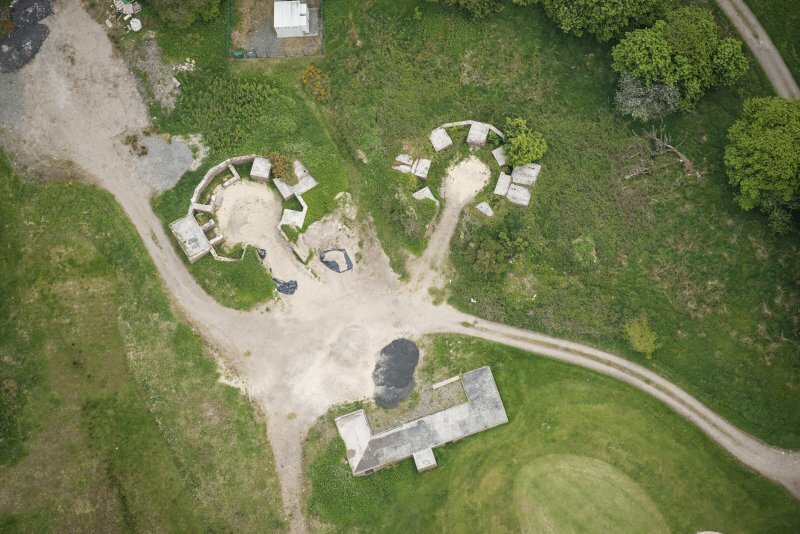 Oblique aerial view centred on the remains of the anti-aircraft battery and bunkers, taken from the N.
Oblique aerial view centred on the remains of the anti-aircraft battery and bunkers, taken from the WSW. 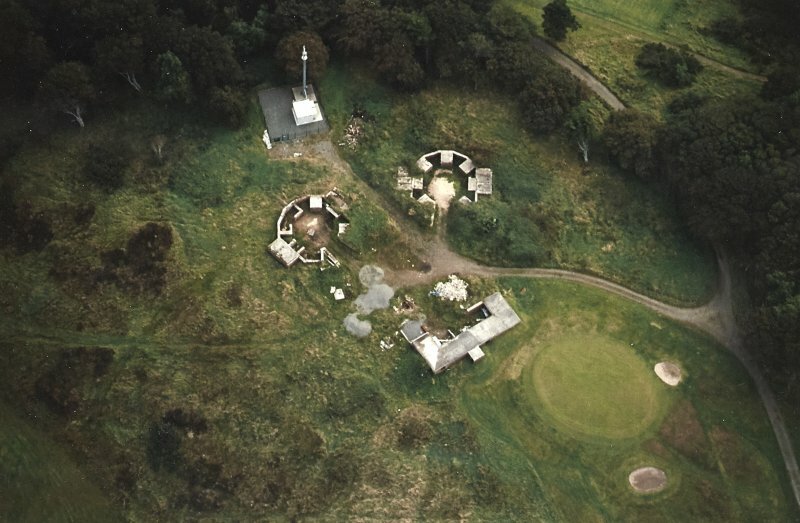 This WWII heavy anti-aircaft battery is situated on Stornoway Golf Course to the N of Lews Castle College. There are two concrete gun-emplacements and a command post. No documentry records of this battery have yet been found. There are WW2 monuments in the area. 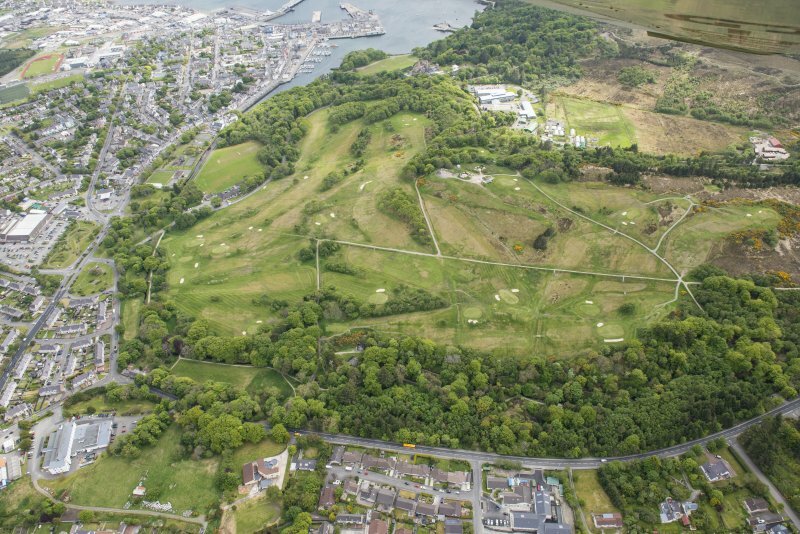 Two bunkers and two gun emplacements are situated on the top of a small hill overlooking Stornoway Harbour at NB 419 336. 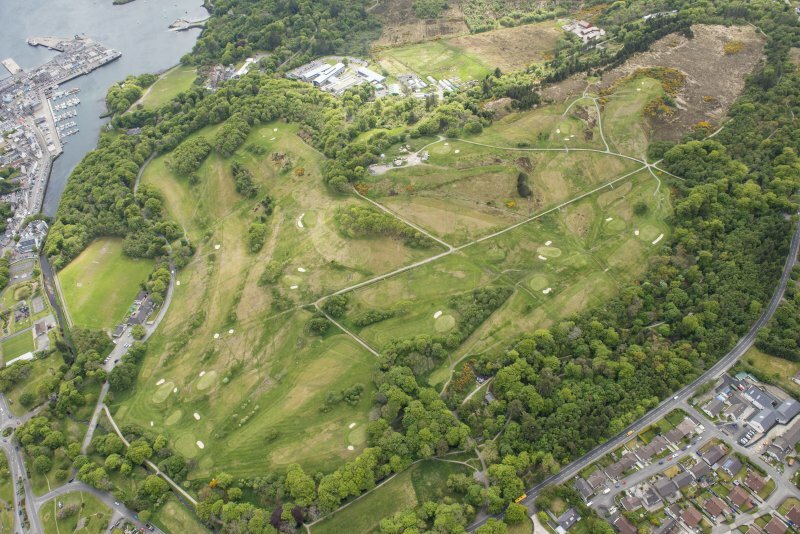 One bunker is situated some 20m to the NW of the guns, the second bunker is dug into the hillside 40m to the SE in front of the gun emplacements. 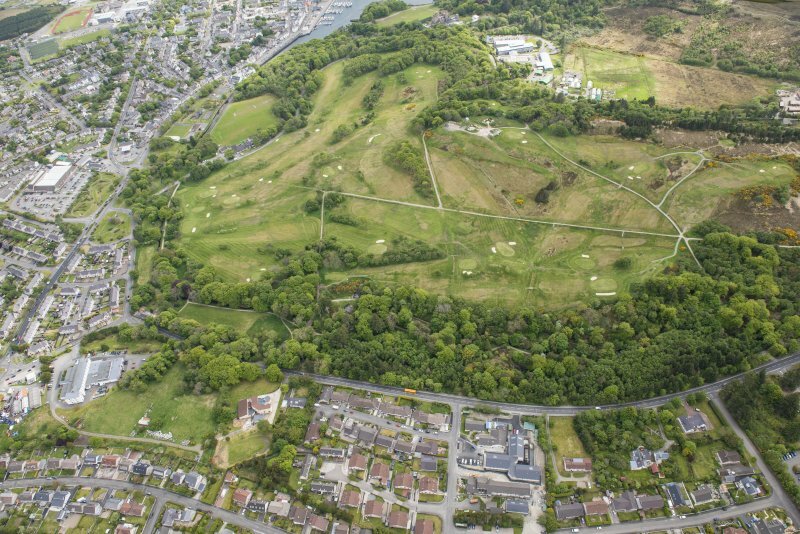 A two-emplacement heavy anti-aircraft battery is situated at the top of the hill in an area annotated on current OS maps as 'Ranol' overlooking Lews Castle and Stornoway and within Stornoway Golf course on the 50m OD contour line. The brick and concrete octagonal emplacements (NB 41948 33628 and NB 41973 33641) measure about 8.80m in diameter internally and 13.20m in diameter overall. The entrances are to the N and NW respectively and are now heavily covered in dense vegetation especially bramble bushes. Both emplacements have ready-use ammunition lockers and crew shelters built against the outer wall. 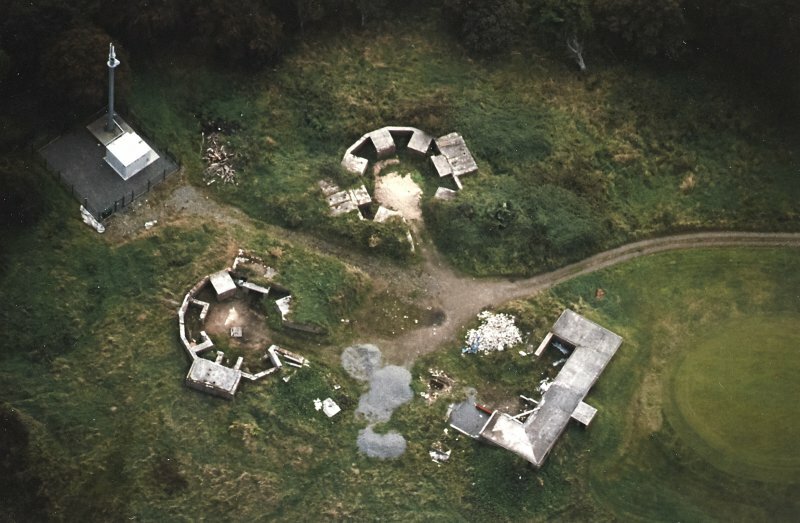 The command position (NB 41939 33661) is situated about 29m NW of the emplacements. Built of brick and concrete it has been partially demolished, only the N wall and the two gable ends survive. Evidence for the compartment layout can still be seen on the surviving walls. No holdfasts for the guns were noted on the date of visit and no evidence could be seen for them in the concrete platform. A further concrete structure was noted at NB 42004 33591, it was not entered on the date of visit and the purpose remains unknown.